St Andrew’s, Ufford is a fine late medieval church built entirely of local limestone. 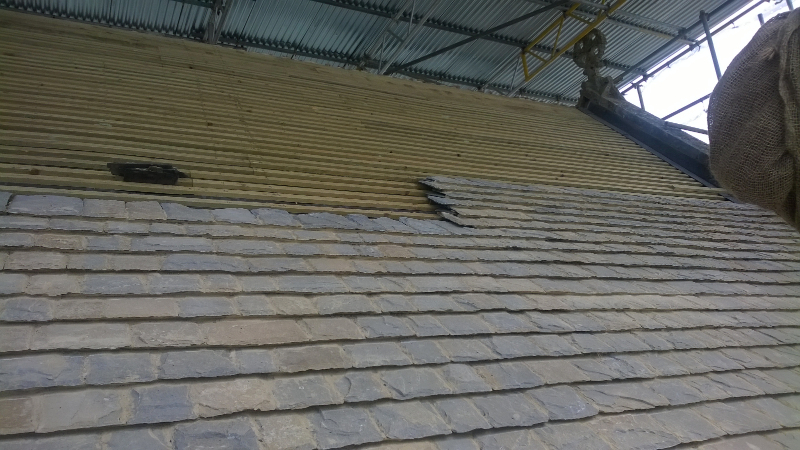 The chancel roof was covered with wonderful Collyweston slates but a number were missing and damaged, and re-slating was of high priority in order to avoid damage to the roof structure. Collyweston slates take their name from a small village in Northamptonshire where their production started centuries ago, the slates contributing to the distinctive appearance of many historic buildings in Northamptonshire, Lincolnshire, and Cambridgeshire. The mining for the slate hit its peak in the late 1800s but stopped almost altogether in the 1970s, when the extraction of the distinctive limestone slates became commercially unviable. Production of the slates traditionally relied on hard winters causing natural frost splitting of the quarried stone. The lack of new slates in recent decades has caused the supply of Collywestons to rely on re-using slates from existing buildings. As a result many old unlisted buildings are gradually being stripped of Collyweston slates which are sold on, sometimes by unscrupulous dealers. The current stock is in continuing decline and also the characteristic sizes are diminishing, as reclaimed slates need redressing. 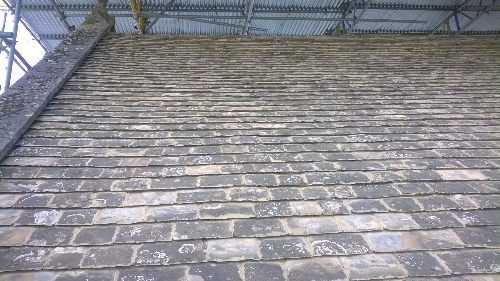 As part of the drive to encourage the production of new traditional stone roofing slates, Historic England has carried out trials with Messenger Construction Ltd. to develop a successful production method, which is based on artificially accelerating the natural frost splitting process. The prepared log mined from a local quarry is frost-split in a specially designed freezer unit ranging from -8 to +8 degrees centigrade over a 7 day cycle, then clived into suitable thicknesses for new slates, and dressed in the traditional way. At Ufford we have re-used the existing Collyweston slates on the North slope, the elevation visible by road, and used the new slates on the south slope. On this project the Trust has had the opportunity, with Messenger, to promote the new method, which could play an important part in developing new production of Collyweston slates. We feel that this is an essential step if this fine traditional material is to have a future in the long term.